Free Shipping Included! REOLINK Solar Panel Power Supply for Wireless Outdoor Rechargeable Battery Powered IP Security Camera Argus 2, Waterproof, Adjustable Mount, Continuous Power Supply by REOLINK at Mamboe. MPN: Reolink Solar Panel. Hurry! Limited time offer. Offer valid only while supplies last. 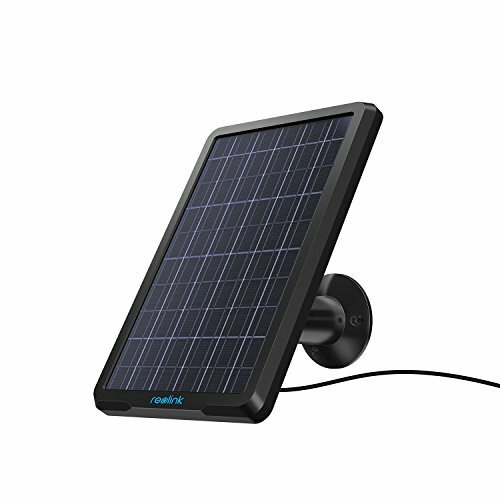 NON-STOP POWER SUPPLY: Connects Reolink Solar Panel to Reolink solar-powered security camera Argus 2 to get non-stop power from the sun. With just a few hours of sunlight, your Reolink Argus 2 will stay powered day and night. WEATHER-RESISTANT: Weatherproof design to withstand rough weather conditions; more durable, long-lasting, and cost-effective. EASY INSTALLATION: Adjustable mounting bracket allows you to easily position the solar panel and ensure maximal sun light exposure. COMPATIBLE WITH REOLINK ARGUS 2: Designed for Reolink Argus 2 rechargeable battery camera and provides continuous charging for Reolink rechargeable battery/solar-powered cameras. 2 YEARS WARRANTY: Reolink solar panel is supported by Reolink 2-year limited warranty to provide better service and quality guarantee, 30-day money back guarantee. If you have any questions about this product by REOLINK, contact us by completing and submitting the form below. If you are looking for a specif part number, please include it with your message.